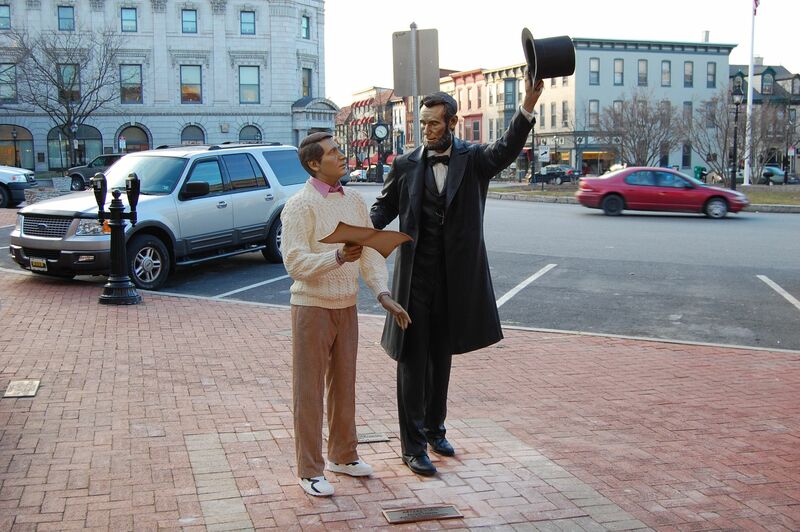 Today we’ll take a look at the recently returned statues of Abraham Lincoln and a modern-day tourist/speech reader in the center of downtown Gettysburg. This view was taken facing southwest at approximately 5:10 PM on Wednesday, February 15, 2012. Originally installed in 1991, the statues require cleaning and repairs every few years. This view was taken facing northwest at approximately 5:10 PM on Wednesday, February 15, 2012. The statues were removed in November and returned to the town Diamond in front of the Wills House this week. This view was taken facing west at approximately 5:10 PM on Wednesday, February 15, 2012. 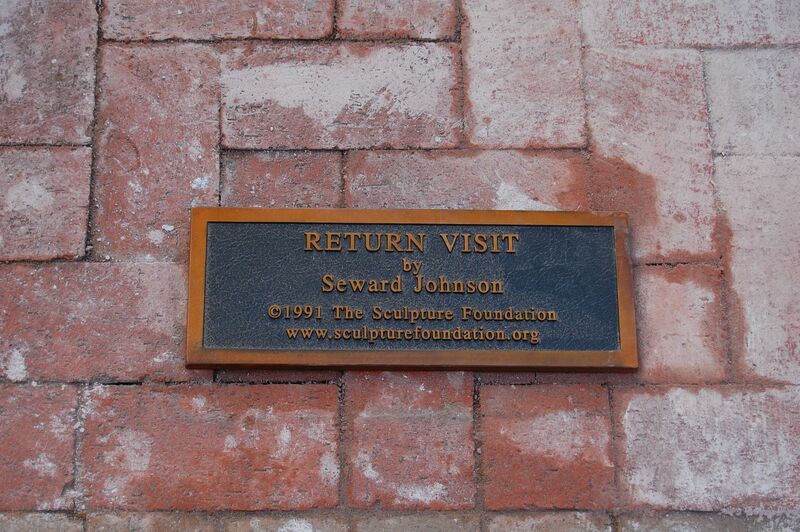 Along with cleaned and restored statues, there is also a new plaque with the sculpture’s official title, “Return Visit.” This view was taken facing west at approximately 5:10 PM on Wednesday, February 15, 2012. 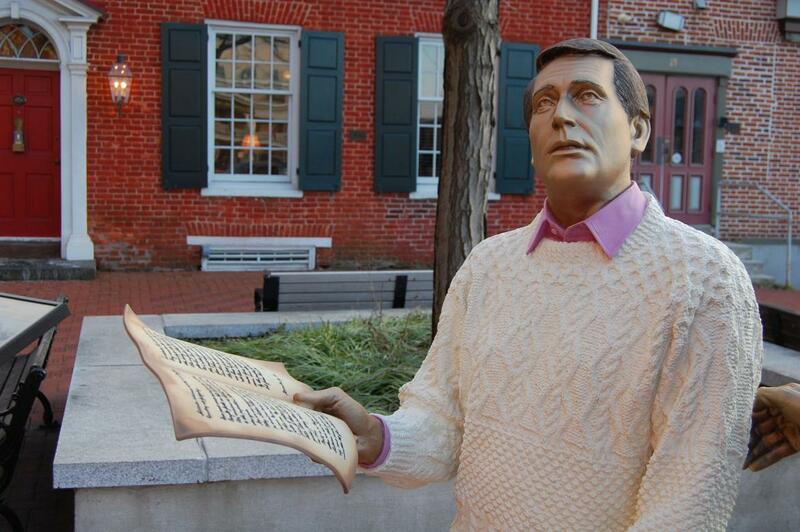 Opinions on this statue can be mixed. 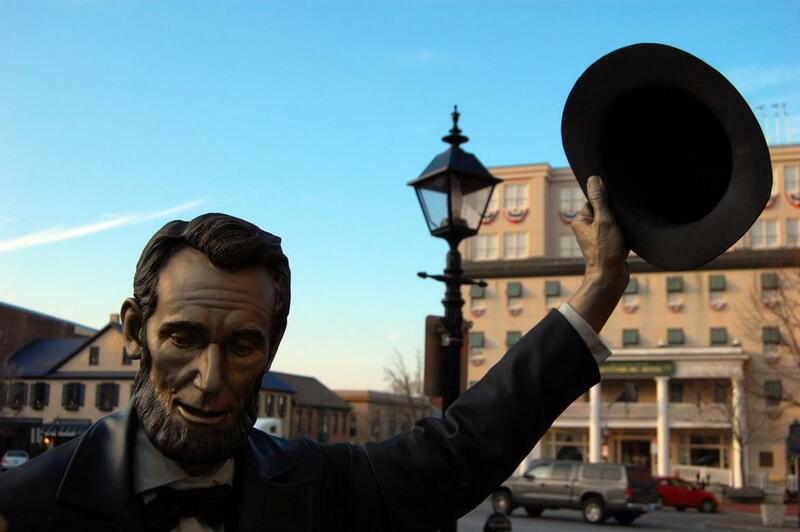 Some admire it for depicting the link between past and present … This view was facing west at approximately 5:10 PM on Wednesday, February 15, 2012. 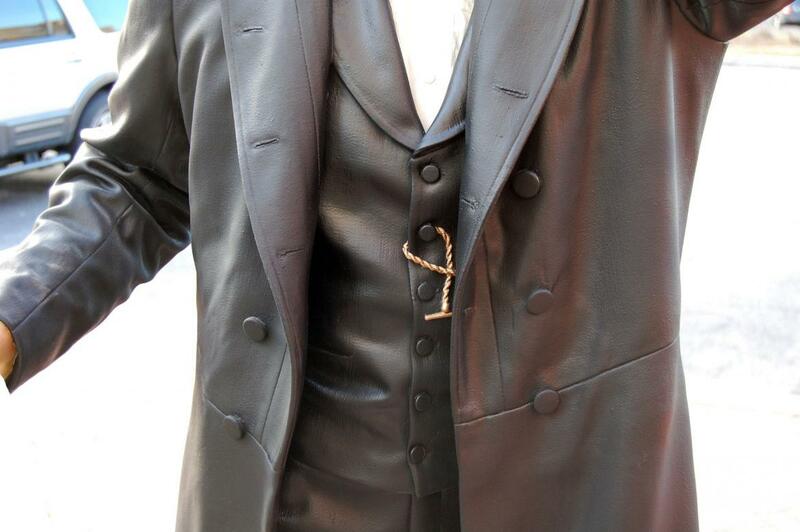 … and giving us a literal, if anachronistic, take on learning from our history. This view was facing west at approximately 5:10 PM on Wednesday, February 15, 2012. 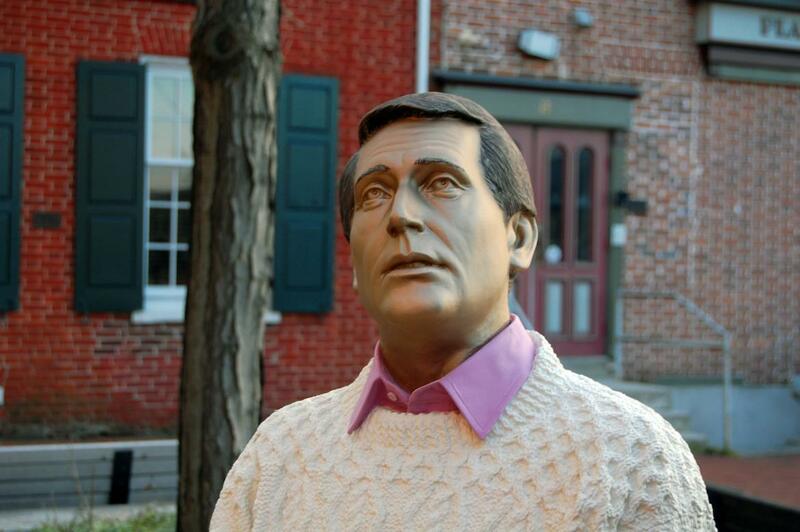 The sweater-wearing everyman was referred to as Perry Como in 1991 when the statue was installed, and depending on who you ask, this is meant disparagingly. 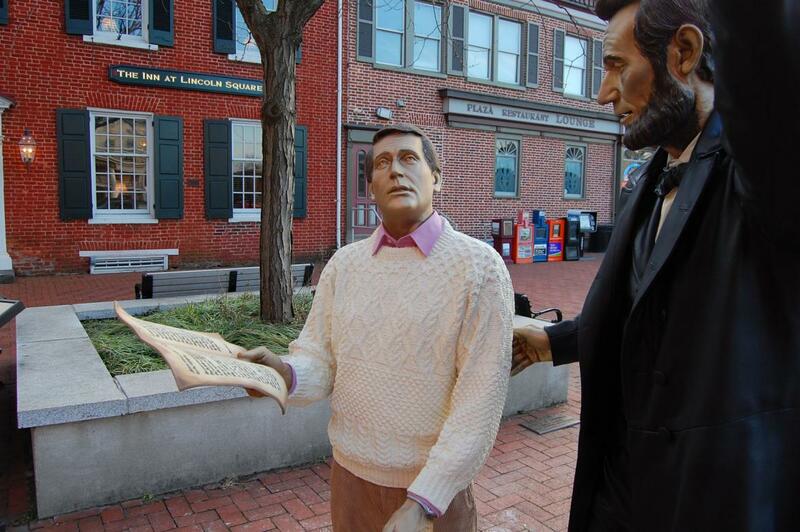 To quote from a Gettysburg Times reader when discussing the possibilities of the statue in October of 1990: “And to have Lincoln pointing to THE room, with a modern speech reader beside — I ask you, how tacky can you get? 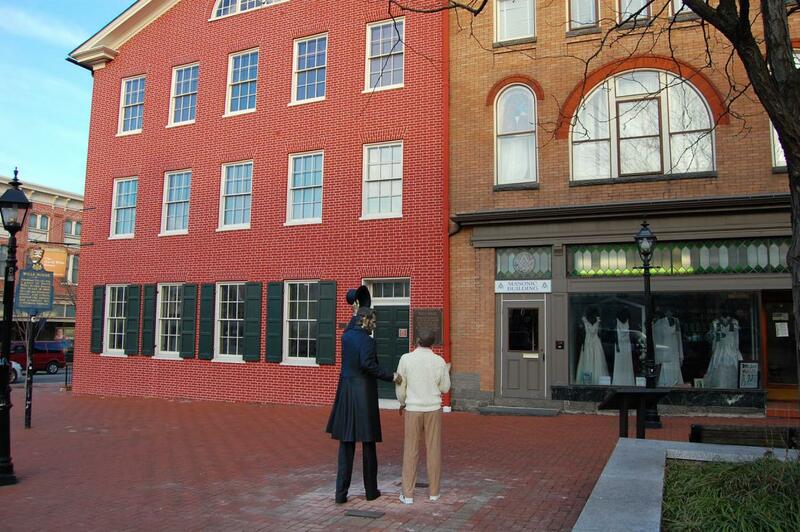 Pure tourist!” The David Wills House is in the background. This view was taken facing northeast at approximately 5:10 PM on Wednesday, February 15, 2012. 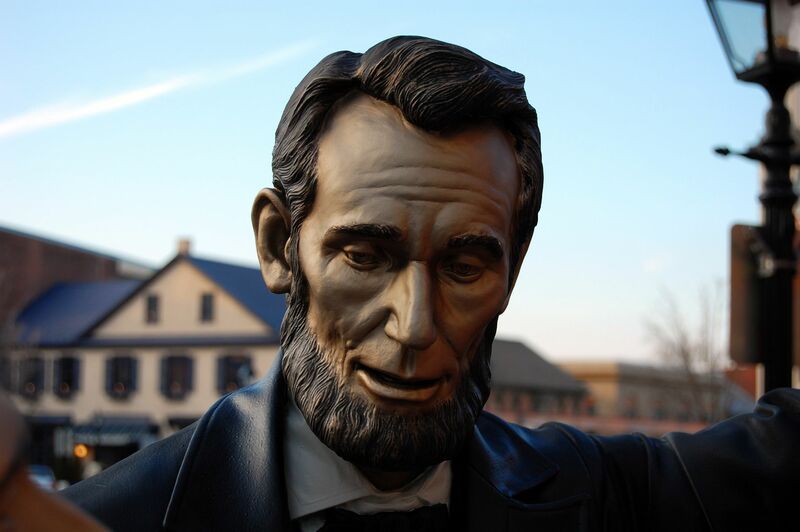 The Gettysburg Address that the reader holds in his hands is often the focus of upkeep efforts due to damage incurred from touching and hanging on the statue. This view was taken facing northeast at approximately 5:10 PM on Wednesday, February 15, 2012. 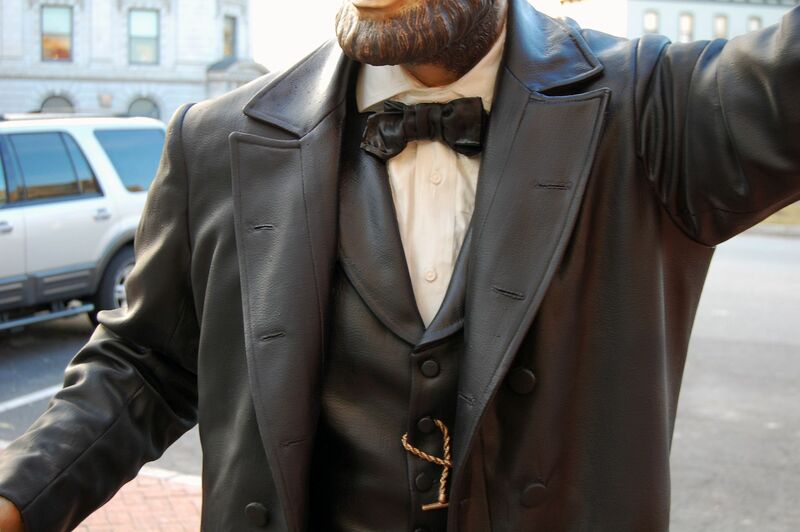 In the next few images we’ll show you some detailed views of the Lincoln Statue. This view was taken facing northwest at approximately 5:10 PM on Wednesday, February 15, 2012. This view was taken facing northwest at approximately 5:10 PM on Wednesday, February 15, 2012. This view was taken facing west at approximately 5:10 PM on Wednesday, February 15, 2012. “Oh, so you wrote the speech I’m holding in my hands in that room, Mr. President? 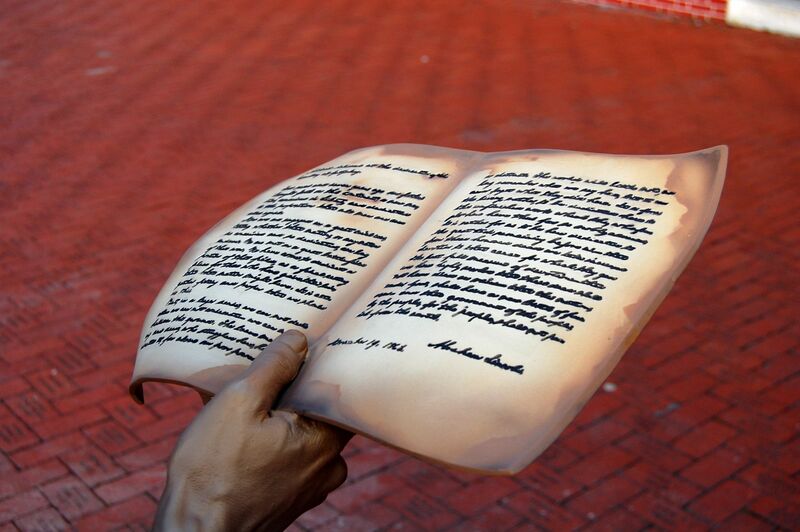 I enjoy carrying this handwritten copy of your speech, because it is both portable and easy to read.” This view was taken facing south at approximately 5:10 PM on Wednesday, February 15, 2012. 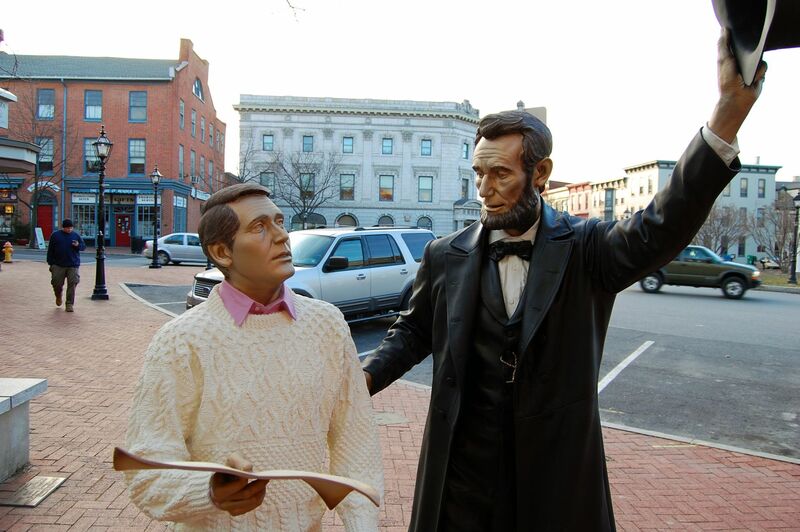 One wonders … does Lincoln ask him about the pink undershirt? This view was taken facing south at approximately 5:10 PM on Wednesday, February 15, 2012. 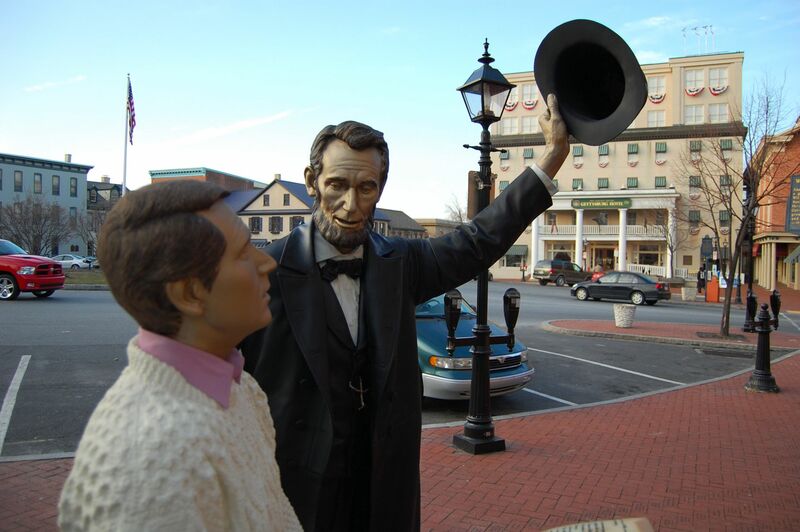 The statues are located on the southeast quadrant of the town square/diamond. 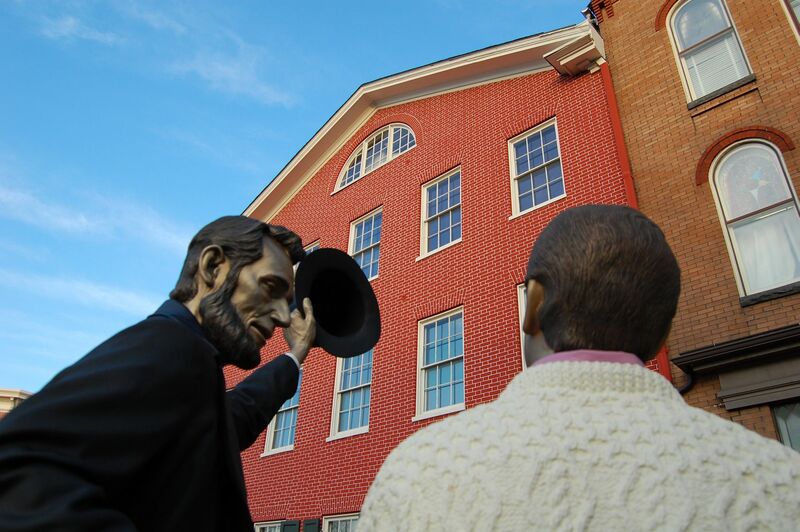 The David Wills House is in the left background. This view was taken facing northeast at approximately 5:10 PM on Wednesday, February 15, 2012.